Instant Pot Chicken Corn Chowder will warm you up from the inside. You can eat a nice big bowl of it while watching the snowflakes fall outside your window. Winter isn’t done with us yet. Snow storms all over our neighbors to the East! I’m sending you all the warmest vibes I can muster up. 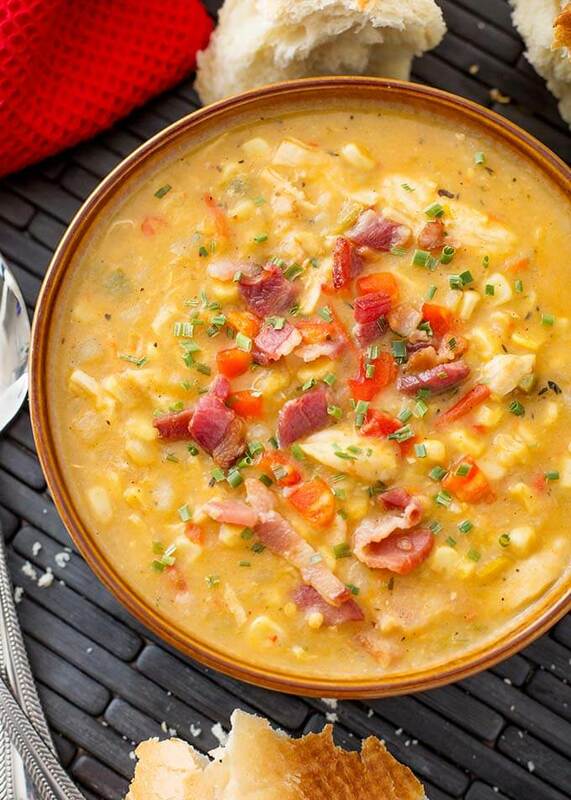 And this hearty, comforting recipe of pressure cooker chicken corn chowder. Who doesn’t love a nice snowfall? But geesh, the East Coast has been hit hard in these last weeks of winter. I sometimes complain about the rain here, but I’m fine with it, nevermind! Let’s talk soup, for surely you folks in the colder parts of the US are eating vats of it to stay warm and comforted. Make this Instant Pot Chicken Corn Chowder, and relax while you ride out the storm. I was asked why I don’t call for cutting up the chicken into bite-sized pieces in many of my recipes that call for chicken breast. The simple answer is that a larger piece of meat can withstand the longer cook times without drying out. My Fettuccine Alfredo with Chicken is a perfect example of that (Paul didn’t like it when I cut the chicken up. It was dryyy). So making it with a whole breast, or just cut in half keeps the chicken breast juicier. If the cook time is only about 3 minutes, then the cut up breast comes out better. When I make Instant Pot Chicken Corn Chowder, I use frozen corn kernels right from the bag. I don’t bother thawing them. This is also a great time to use up those last 2 potatoes that are starting to sprout. You know what I mean! Just peel and dice the potatoes, and add them in. Also, I don’t blend the soup to puree it. This is a chunky chowder. I use a potato masher and just mash it right in the pot before serving. 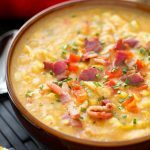 Instant Pot Chicken Corn Chowder is hearty and delicious with lots of chicken, corn, potatoes, bacon, and other great flavors. 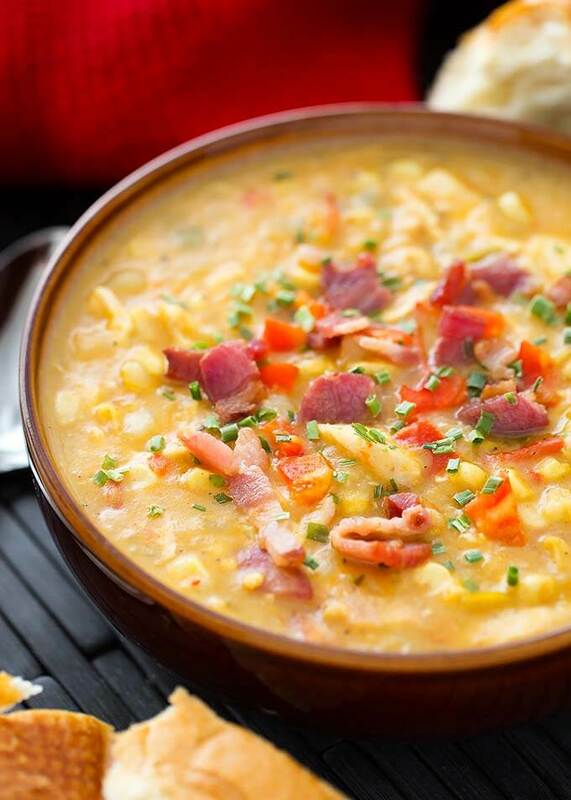 This pressure cooker chicken corn chowder is a great comfort food soup. Gather everything you will need first. Then cut the veggies, bacon, chicken, etc. and have it all ready to go. This will make the process much more fun, or less stressful! Turn on the pot's sauté setting. Add the chopped bacon and cook until done. Remove to a paper towel to drain. Remove all of the bacon fat except for 1 Tbsp. Add the onion, celery and cook, stirring occasionally, until starting to soften. Be sure to scrape the bottom of the pan and get up any brown bits (deglaze). Add oregano, thyme, salt, pepper, and smoked paprika, stirring well. Add the garlic and diced green chiles. Stir. Add the potatoes, jalapeño, red bell pepper, broth, and corn. Stir well. Add the chicken. Close the lid and lock into place. Set the steam release knob to the Sealing position. Cancel the sauté setting. Press the Pressure Cook/Manual button or dial, and the + or - to select 8 minutes (High Pressure). When the cooking cycle is finished, let the pot sit undisturbed for 10 minutes (10 minute natural release). Then do a controlled quick release of the remaining steam/pressure. Open the lid when the pin drops down. Remove the chicken with tongs to a plate and set aside. Mix the cream and flour together well. Turn on the sauté setting again and when soup starts to simmer, stir in the flour mixture. Keep stirring for a minute to be sure it is well combined, and the soup thickens. Turn off the pot. Use a potato masher to mash some of the potatoes and give the soup that nice chowder texture. Shred the chicken with 2 forks, and add back into the soup (we do it this way so the chicken is not dry). Add the cooked bacon back into the soup and stir. You can save some for garnish if you'd like. Taste and adjust salt if desired. Serve with some crusty bread, or in bread bowls. 6 Quart IP was used for this recipe. What type of potatoes, red, russet? Hi Barbara, I used russet, as that’s what I have most often. You could use gold or red as well, if you want. Can I use it for slow cooker as well? Yes, Carly, absolutely! Try 3-4 hours on High, or 6-7 on Low. Is the chicken raw or cooked when you put it in? One of the best soups I’ve ever had! Thank you so much. Wow! That’s so great, Andrea! I’m really glad you liked this soup! Thanks for your review! I made this tonight. It was only while i was putting it together that I realized I had forgotten to buy potatoes at the store. Ugh. After I made it and it was sauteeing, I thought hey, I still have some dehydrated hash browns in the cabinet, so I tossed some in the pot. It was amazing! Loved it. Thanks so much for this awesome recipe! I forgot to buy potatoes but threw in some dehydrated hash browns, and it was amazing! Thanks for a new favorite fall recipe! Great ingredient hack! Thanks for the tip! Would you adjust the time if using frozen chicken breast? No, I would keep the time the same. Spicy! Next time I’ll use half a jalapena. Delicious taste, smooth and creamy, we liked it a lot! Glad you liked it! Also make sure the diced green chiles are the mild ones! i don’t eat pork would it be good without? Yes, or you can use turkey bacon! When doubling this recipe should you double the time??? Hi Latoya, no need to double the time. I used your recipe as a guide and made of lot of substitutions based solely on what I had on hand. No bacon, chili or jalapeño, sweet potato and carrot in place of white potato, frozen corn and a can of copes dried sweet corn, lactaid whole milk in place of cream and I used my homemade IP bone broth in place of chicken broth. I also added shredded smoked Gouda at the end. All spices and cooking methods were done per the recipe. The end result was absolutely delicious! So while I didn’t make this recipe to a T I did prove that your recipe is an awesome base and all cooking times are perfection regardless of what you add to it. Thank you!